Anyone dealing with this in your app? Stupid question maybe...but if we remove distribution from the EU market(s) would we still need this compliance? Thx. then, it should be all = 31. What is your problem with the GDPR? All it does is put into law what is best practice for any app. If you are using users’ personal data you need to have a valid reason for doing so, you need to make it clear to the user, and you need to get their consent. All it does is stop developers from using personal data improperly, i.e. for an improper purpose, or deceitfully, hiding it from users or doing it without asking. But such was appallingly bad practice before the law, and is frowned on even in the US where there is no similar law. See e.g. Unless your app/game is specially targeted at a local market, or has really small numbers I imagine no-one would cut off EU users. It wouldn't just be 10% of world's population but 22% of world's spending power. "The European Union is the second largest economy in the world in nominal terms and according to purchasing power parity (PPP)." I use it for AdMob for example. btw: The not publishing to the EEA territories is just a filler solution until your app has a clean solution. Hey..this is all new to me, but it is obviously more than just adding a policy statement to your website and linking to it. I suggest some reading here, and then please reply with your thoughts. Thank you. For personalised ads you can add an option in the settings page or so! @Shaun Max - Thx for the reply, but if you read through the google requirements, it's more than just allowing the user to opt in/out of personalized ads imop. "If your agreement with Google incorporates this policy, or you otherwise use a Google product that incorporates this policy, you must ensure that certain disclosures are given to, and consents obtained from, end users in the European Economic Area. If you fail to comply with this policy, we may limit or suspend your use of the Google product and/or terminate your agreement." "You must clearly identify each party that may collect, receive, or use end users’ personal data as a consequence of your use of a Google product. You must also provide end users with prominent and easily accessible information about that party’s use of end users’ personal data." At first I thought I could just make a generic dialog with a link to a privacy statement on my website, and then perhaps have a checkbox to turn personalized ads off/on, but apparently google wants apps to have full disclosure in regards to advertising partners. If you only use up to 12 providers you can use their consent sdk which will display these providers to the end user, more than 12 you have to roll your own interface. I'm currently using distriqt's Adverts and they have built in support for the Google Consent SDK, I don't have it working yet but it seems to be a clear path to allow Google to accept your app in the EEA markets. i believe your app is not live yet and have only admob in it. so you should be fine. also google will be the last person to reject your app if you are not gdpr compliant. before rejection they should inform you whats wrong and give you enough time to fix it. so if you are done with the app go ahead submit it. and take a break. this ane doesn't support the GDPR google consent dialog (it's not multilingual), you will have to create it with two choice "personalized" or "non personalized" and a link to the private policy. And send the result to AdMob for example. Will a solution be to use flash.system.Capabilities.language to check for users device language? I don't know if it's a valid solution or not, since we can install any language on a device. My solution for my upcoming game is to show the select screen (personal, non personal or none) to everyone that install my game. The risk is that many users will choose not to see any ads at all, also outside EEU countries. I also want people to try my game before they buy the ad-free version or not, so I don't want to force them to either view ads or purchase it before they can play it. I have a text on the main menu and on the game over screen that says "Keep this app free by allowing it to show ads etc. ", so hopefully some users will allow the app to show ads if they like the game, but it's just a guess. Why disable ads? The only difference it should make is showing personalized ads if the user consents, or general ads if they don't. I use AdMob, and from the docs I need the user to agree to either personalized or non-personalized ads. ("Ads served by Google can be categorized as personalized or non-personalized, both requiring consent from users"). So I will change the buttons in my game like "Show normal ads (non-personalized)"
Actually...to comply legally..it's much more than just a simple "yes or no" for personalized ads or not. You're also supposed to show the end user who will be getting access to the data you collect if you show personalized ads. ie: Everyone advertising in your game. "One option is to use the Consent SDK to present a Google-rendered consent form to your users. The consent form displays a list of the ad technology providers you've selected in the AdMob UI. The Consent SDK stores the user consent response." 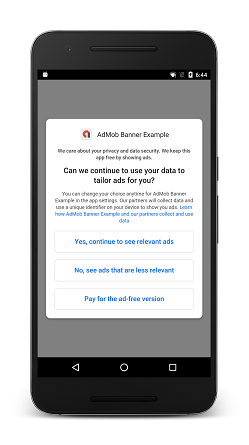 "The other option is to use the Consent SDK to dynamically retrieve the full list of ad technology providers from AdMob, as explained in publisher-managed consent collection. However, in this case you'll need to determine how the list of providers should be made available to your users and present your own consent form to your users." and Google currently is unable to obtain and handle consent for mediation networks, so you'll need to obtain and handle consent for each ad network separately. my Android ANE detect if is an european user, retrieve dynamically the full list of ad technology providers from AdMob, save consent.